Cradled in the cluster of thirteen mountain peaks of the Aravalli ranges, the formidable medieval citadel, Kumbhalgarh stands a way sentinel to the past glory. Rising from a prominent ridge, 1914 mts. high from the sea level, the fort was built in 15th century A.D. by Maharana Kumbha and is the principal fortification after Chittaurgarh, lying 90 km north-west of Udaipur. The massive fort encompassed by a 36 km long wall, has seven majestic gates and seven ramparts, one within the other. 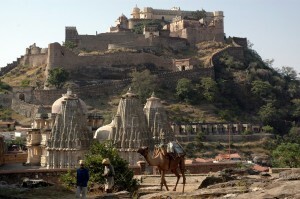 There are many magnificent palaces and an array of ruined temples is located within the fort. The most picturesque of the palaces is the ‘Badal Mahal’ or the palace of cloud. The palace offers a superb bird’s eye view for the countryside surrounding the fort as well as of other ruins within the fort. Air: Udaipur 105 km is the convenient airport. Road: Kumbhalgarh is approachable by a good road. Kumbhalgarh Fort: The fort is the second principal fortress in Rajasthan after Chittaurgarh, was built by Rana Kumbha between 1445 and 1458 A.D.
Kumbhalgarh Wildlife Sanctuary: Kumbhalgarh Sanctuary, situated in the lush green environs of Aravali, covering an area of about 585 sq. Km. This entry was posted in Kumbhalgarh, Rajasthan and tagged Kumbhalgarh Fort, kumbhalgarh fort kumbhalgarh, kumbhalgarh india, Kumbhalgarh Wildlife Sanctuary. Bookmark the permalink.